HP TouchPad meets the FCC, or webOS tablet comes to D.C. 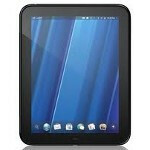 The red carpet was rolled out in Washington D.C. for the HP TouchPad as the webOS flavored tablet got the thumbs up from the FCC. The TouchPad has been flying under the radar, so the specs are not as well-known as those on some of the other tablets that have been launched or will be rolled out soon. So to further educate you on this device, the TouchPad features a 9.7 inch screen with resolution of 768 x 1024. Under the hood is a 1.2GHz Snapdragon processor and up front is a 1.3MP camera. There is no rear camera on the device. There will be a 16GB and 32GB model available and audio is handled by the Beats by Dre system. HP has added some interesting features to the tablet so that it can interact with the Palm HP Pre and other webOS handsets. For example, if your Pre 3 is ringing, you can pick up the call on your TouchPad. There also will be a way to take data and swap it back and forth between your webOS phone and your TouchPad with a tap of the screen. So far, there is no word on price or possible launch date, but having met the hot shots at the FCC, things should progress quickly from here on out. In the meantime, if you can't wait for a webOS style tablet, check out the BlackBerry PlayBook. The first "professional tablet" features an OS from QNX that has some webOS-esque (card-like) functions including certain gestures such as swiping up on a window to close an application as it moves up off the screen. For those who must have the real thing, we could see the HP TouchPad launch sometime this summer. If you want to see the HP TouchPad and the Pre in action, then look up I need a Dr by Dr Dre featuring Eminem and Skylar Grey. There is a scene where they are using the TouchPad and a Pre (not sure which one) together for something. Have to watch it closely though. It's at about 4:15 if you find the vevo version on youtube. Cool. I really like WebOS, and seriously thinking of getting the HP Touchpad together with the Pre3. webOS is the most underrated OS out there right now. It's a stellar experience. If they can work out the IM client bugs it will shine even brighter. @skymitch89, Thanks for your post. They transfered a pic from the Pre to the HP TouchPad; Instantly! hopefully that's a dual core processor, because a single core would be underpowered. The Touchpad is confirmed to be dual core. I'm not sure about the Pre3 though.